Toy Theater is a collection of early learning activities. There are many different activities so it's well worth exploring. You'll find sections for Math, Music, Puzzles, Reading, Playset, Games and Art. As well as describing some activities I liked in the Art section below, I've included ideas for linking to literacy. Under the Art tab, you will find Doodlepad, Matisse's Pieces, Stop Motion Animation, Monster Masks, Quilt Patterns, Animation Station, Japanese Print, Mask Puppets, Sculpture Machine and Greek Mythology. The emphasis in many is on colouring digitally. Because I know some of my readers are fascinated with all things Japanese, let's check out Japanese Print first. 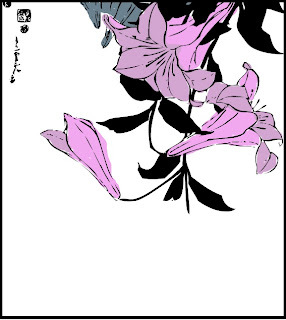 Basically, you choose one of Hokusai Katsushika's wood block prints like the one in my picture here, then colour digitally with crayon to make your own picture. There is a huge range of colours available. It might make a lovely illustration for a haiku, a three line poem about nature. Some activities are more interactive, and allow you to arrange elements on a page, like Matisse's Pieces. Let your kids play with it, until they find an arrangement they are happy with. You could take a screen grab or print the result, then find words in magazines and newspapers to accompany your art work. Mask Puppets lends itself to writing a short script or dialogue between finger puppets. At Stop Motion Animation, you could ask your kids to make an animation, then have them describe what took place, or write a procedural text to explain their process. Toy Theater would be a nice web space to visit as a followup to your real life excursion to an art gallery, or to sharing books about art from the local library with your kids. I like to print the Japanse prints and let my daughter color them without the help of the screen. Thank you. Toy Theater has some new additions that I hadn't seen, thanks for the encouragement to check it out again! That's a great idea, Paula - thanks for suggesting it. Sometimes I get a little blinkered by technology! It's great to see these web spaces growing and changing, isn't it, Kelly.